Is it possible to access EXIF data that is embedded into photo files & then select a range of 'Date Modified' & change it back to 'Date Taker'? If so how is it done? The reason that I ask is that if you use programs like Windows Explorer or Photoshop Elements to do things as simple as rotate the picture 90 degrees you will now find your picture displaying the meaningless date modified instead of date taken which is what most people would want. I have been on a holiday where there are as many as 4 camera all with the correct time/date set & they take their pictures. All pictures are placed in one folder & you would expect that all pictures taken at the same place time & date would me sorted together but they are not. Re: Change EXIF date from 'date modified' to 'date taken'? 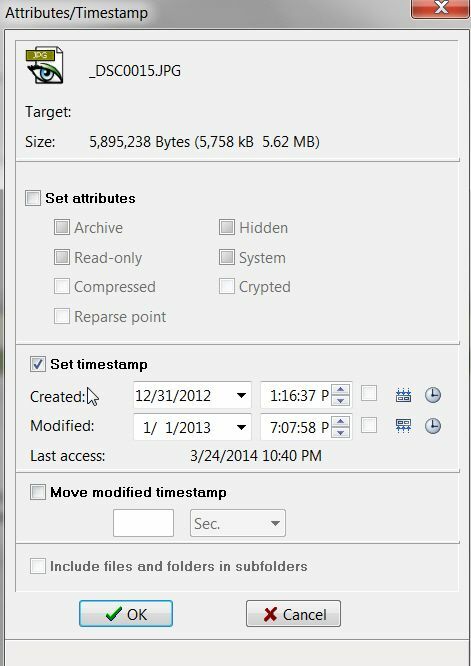 The internal EXIF metadata should show "date/time original". I don't believe that would change if you rotated or otherwise edited the image. It is the Windows external file info where you see "date created", "date modified", and "date accessed". Is that what you're referring to? Note that with Windows Explorer you can change the column headings shown, so you can see whatever dates you want to see with proper text in the heading. 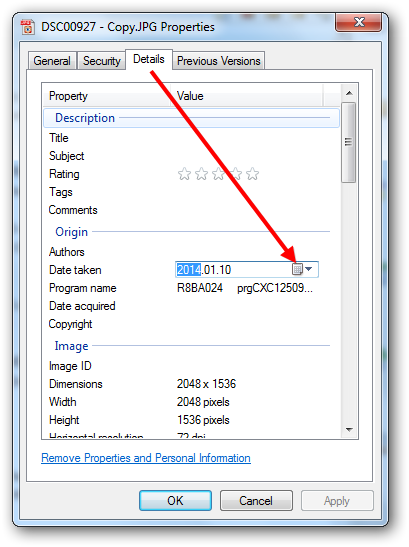 I believe by default the date shown for images is the EXIF "date taken"... not the Windows "date modified". Now are you looking for a simple way using FC to reset any of those Windows external file info fields... like the "modified date", to reset it to whatever value you want to? Certainly possible. If you don't already have a toolbar button for RAHS, you can easily add it. Right-click on the toolbar and select "customize". Then go to File 1 -> and check the "RAHS attributes/timestamp" box and push OK. You'll now have that "RAHS" button on the toolbar. You can then select the folder where the files are that you've rotated and which have thus had their "date modified" values changed. You can then click on the date column heading to sort them into ascending or descending order, or you can just select all the files you want to change their "date modified" values to something else (e.g. to match "date taken") using the standard CTRL+select technique (holding the CTRL key down while you mouse-select each of the files you'd like to include). Then push the RAHS button (or if you didn't have an RAHS button on the toolbar, just File -> RAHS) and manually change the "date modified" value. Check the "Set Timestamp" box, enter the date values you want to force, and then push OK. All of files you'd selected will have their timestamps reset as you've specified. P.S. It's not normal for windows explorer to change the Exif -> Date taken attribute when doing actions like image rotation; are you sure it's not the file attributes that change?